The Gulf of Maine is one of the largest semi-enclosed coastal seas in North America, and is recognized as one of the world’s richest marine ecosystems. Over 3,000 marine species and birds call the Gulf of Maine home. Coastal marshes and estuaries serve as nurseries and feeding grounds for fish, crabs, and shellfish, and abundant plankton provide the base of a rich food web all the way up to large fish, seals and whales. The Gulf of Maine provides a sanctuary for more than 30 species at risk, including the roseate tern and the critically endangered North Atlantic right whale. The initial influx of people to the Gulf of Maine began approximately 12,000 years ago and the first European settlements began to appear in the region in the early 1600s. Now, over 10 million people live in the Gulf of Maine watershed. Along its shores lie the cities and towns of coastal Massachusetts, New Hampshire, Maine, New Brunswick, and Nova Scotia. The Gulf has supported a long tradition of fishing, marine transportation, coastal development, and recreation, and continues to be a valuable resource for the people who live and work in the region. The Gulf of Maine Council GeoTour was created to highlight just some of the areas and features that make this region so important. It provides an opportunity for you to get out, learn more about and experience the beauty and value of the Gulf of Maine for yourself. The GeoTour includes a total of 25 sites around the Gulf of Maine for you to visit; five sites in each of the five provinces or states that border the Gulf of Maine. GPS coordinates will lead you to the site and a 1-page site description provides you with interesting information and facts about each site. To add to the adventure, we have included a question about each site for you to answer. By answering the question, you will accumulate points and with enough points you will be eligible to collect a limited edition Gulf of Maine Council Geocoin. 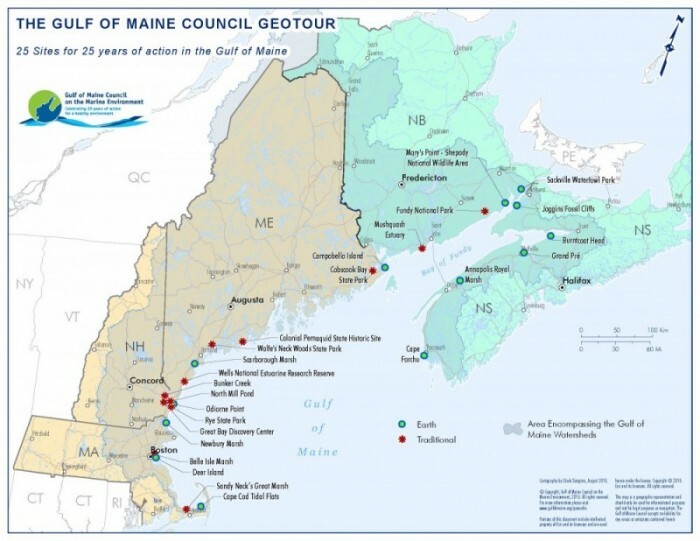 To participate in the Gulf of Maine Council GeoTour, click here.